This article is about the island. For the Daedra of the same name, see Herne (creature). Herne is an island off the west coast of Hammerfell, north of Cespar. 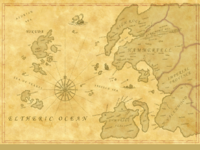 It is most notable for acting as the temporary refuge for the Yokudan nobility, known as the Na-Totambu, during the Ra Gada exodus to Tamriel in the early First Era. Although some sources claim Herne was uninhabited before their arrival, others claim that it was inhabited by a tribe of Nedes, led by a warchief named Haakon. The Nedes had successfully repulsed many attacks by elves prior to the arrival of the Yokudans, but the Ra Gada ultimately exterminated them. After the loss of Eyevea to the Mages Guild in 2E 582, Sheogorath considered bringing Herne to the Shivering Isles, but it was not the right shape.